I can’t get over all that I have experienced in the last few weeks. It’s surreal when you leave your home to be in a completely different environment. It’s new, exciting, and the possibilities are endless. South Africa will always be close to my heart because it was the first African country we visited. Unbelievably gorgeous not just the surrounding, but the people and their culture, all of it. 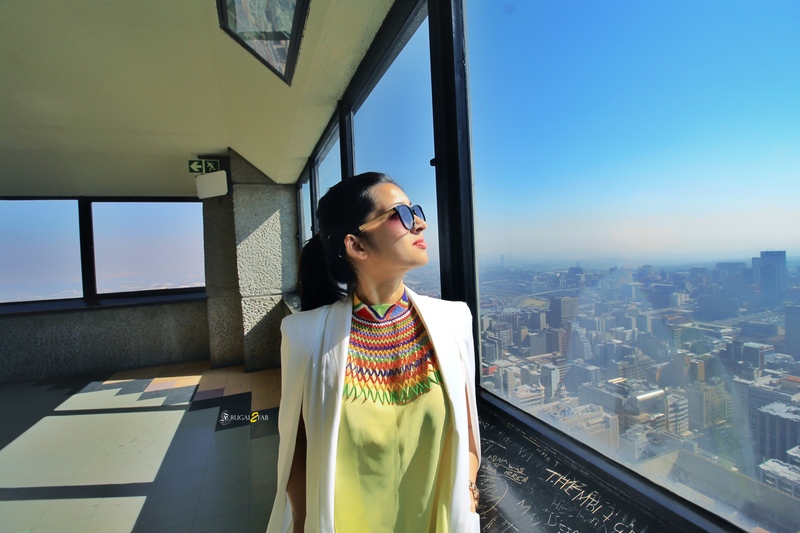 It’s the second day of our visit, and we decide to do a city tour of Johannesburg. It’s a beautiful weather outside, just perfect to wear a cape styled jacket with some classic black jeans. I have been meaning to wear this jacket for awhile now. I just couldn’t find the place or weather to suit it. Delhi winters were too harsh for something easy breezy like this outfit, and summers are just impossible to think about this. So Johannesburg it was. I don’t consider myself a fashionista. In fact, even though I purchased this jacket, for the longest time I wondered how I would style it. Sometimes fate has beautiful things in store for us, and I found that missing bit in a Sunday local market in Johannesburg. The minute I walked in, I fell in love with all the beaded jewellery all around me. The market is only open on Sundays, and they basically transform the top floor parking lot to a Sunday open flea market with loads of local food, fashion and loads of jewellery all around. It was my birthday on the day we stepped into the Sunday flea market. Naturally, there was some level of shopping involved. I purchased this gorgeous statement Xhosa Necklace for 250 Zar ~ INR 1250 bucks. You could find it in different colours, and even in monotone shades. I wanted to pick them all, but I know a little something about buyers remorse. Instead, I narrowed it down to this beautiful multi coloured choker Xhosa Necklace. It’s completely handmade tribal African jewellery that’s definitely found a place in my treasured possessions.